The Weathering Magazine issue 8: Vietnam its here! AMMO Of Mig Jimenez, present the 8 issue of the well know Weathering Magazine. This magazine are more than good quality pictures, this are a must have reference material to every level of modeler. In this one you will find multiples examples of weathering from tanks, airplanes, figures, even a Mecha! all turning around the theme of Vietnam. I grab mine early at the Ipms Nationals convention in Virginia and must say, every issue its getting better and better. Grabs yours before they are all gone! BRAVO 6 US GI "Delta Blues"
As we know Bravo 6 have a fantastic range of figures of the Vietnam Era, this is no the exception with the upcoming kits, this time in a resting pose. 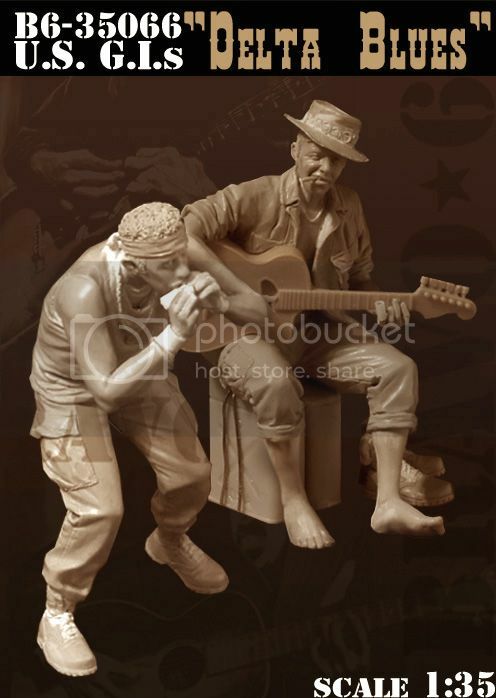 The figures looks very detailed, one of them is in his bare feets playing the guitar and the other standing with the harmonica. Another great set for a diorama or stand alone. Grumman all-weather, carrier-capable, twin jet-engine, subsonic, mid-wing attack and precision strike aircraft - initial production variant. Kit features engraved panel lines, well-appointed side-by-side cockpit, laminated instrument panel, DIANE radar package with optional open radome, optional extended ventral avionics bay, fully rendered Pratt & Whitney engines with separate access panels, intake trunks, detailed undercarriage and wheel bays, pivoting arresting hook, hinged rudder, optional position slats and flaps, choice of extended or folded wings, inner wing fold detail, optional deployed RAT generator and speed brakes, refueling probe, segmented canopy, white metal landing gear struts, vinyl tires and photo-etch parts (turbine fans, seatbelts, seat fittings, boarding step details, radome hinge cover). Also includes ample external stores - centerline drop tank, underwing drop tanks (x4), AGM-12 Bullpup missiles (x2), AGM-45 Shrike missiles (x2), Mk 82s (x12), Mk 82 Snakeyes (x12), GBU-8s (x2) M117 bombs (x6). Color painting guide for (2) US navy aircraft: BuNo 155717 of VA-145 'Swordsmen' onboard USS Ranger and BuNo 152940 of VA-35 'Black Panthers' onboard USS Enterprise - includes stencil data, instrument faces and weapons markings.